How to convert Flash Swf to MPEG-4 and transfer Flash to iPod easily and quickly? 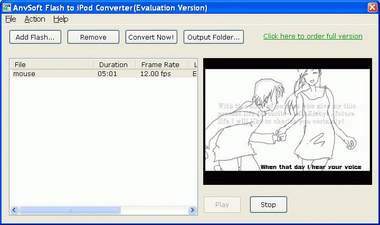 Swf to iPod Converter is a powerful utility that convert Macromedia Flash movie to iPod MPEG-4 files including movie clips, action scripts and audio in the Flash movies. It is designed to convert and transfer Flash to iPod. With SWF to iPod Converter, you can easily turn your Flash videos into memorable projects on your mobile devices such as Apple iPod, Sony PSP and Pocket PCs to share with family and friends. Key Features: Convert Flash Swf files to MPEG4 and Transfer Flash movies onto iPod. Show Flash files on iPod has never been simpler! Share your creative wroks with friends on your iPod. It's so easy that anyone can use it - No need to learn to work with complicated software, Swf to iPod Converter works in just a few quick steps and takes only minutes, even seconds! SWF to iPod Converter is very easy to use even to beginners. Converting your Flash files to iPod plaable MPEG4 files is just a breeze! This really comes in handy and saves a lot of time, when you want to create something truly unique from your SWF Flash resources.